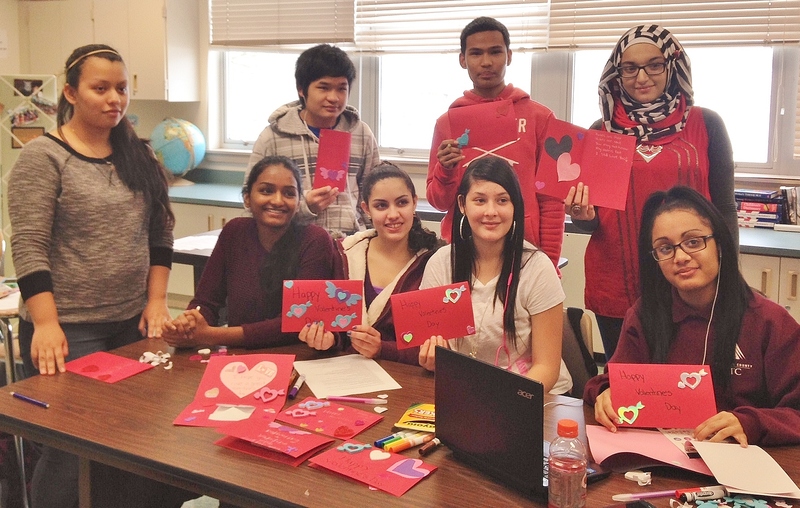 Penn Manor students will be giving recipients of Meals on Wheels something extra with their daily meal in the coming weeks – a handmade Valentine’s Day card. Students in kindergarten through grade 12 in Penn Manor’s English Language Learner program are creating 65 cards for residents who receive meals through the Millersville Meals on Wheels program. The project “is an opportunity for our students to participate in an American holiday tradition and give back to their community,” said Wendy Letavic, ESL specialist and department coordinator. Some of the high school students making the cards helped deliver meals through Meals on Wheels as sixth-graders, Letavic said. 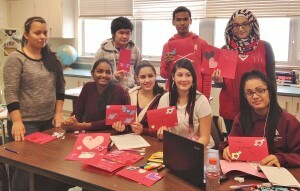 Penn Manor HS ELL students display their cards. They are, (sitting, from left) Alisa Johnson, Chelyann Perez-Irizarry, Cece Fernandez and Sol Sanchez (standing, from left) Edna Almanza, Wah Wah, Anup Tamang and Douaa Jellouf.